Many common questions are answered in our camper handbook, which is published each March before the camp season. Registered campers will receive one by post, but you can also view the document online. Check out this season’s handbook. Am I tough enough to make it at Deerfoot? You don’t need to be Bear Grylls to have a great time in the outdoors at Deerfoot. Campers of a wide variety of athletic ability and outdoor experience levels call Deerfoot their camp home. That said, Deerfoot is not for everyone. Every camper goes on age appropriate hikes, chosen to challenge them. Every camper bathes in the lake, sleeps in cabins etc. These are fun camp elements for most boys, but campers should be aware of them ahead of time. Parents, we ask that you involve your son in the decision to choose Deerfoot, and help them prepare for the challenges of an experience away from home. Do I have to do all the activities? Campers get to choose from 10 different instructional areas each day, but there are many camp activities that they must participate in whether they choose to or not. These include hikes, all-camp games, and cabin devotional times. Camp is great fun, but not all aspects of it are optional. This is how we maintain the program and steer it in the direction that most promotes camper growth. What if I can’t afford Deerfoot? Is there scholarship available? If scholarship help is needed, please request a scholarship form from the camp office (call 855-HIS-CAMP or email martha@deerfoot.org). Since camper fees cover only 60% of operating expenses, Deerfoot depends on contributions from people who believe in its mission to build godly men. These contributions make it possible to keep camper fees at manageable levels while providing the resources necessary for quality staff, program, facility, and equipment. Can we arrive or depart early/late? Deerfoot cannot accommodate requests for campers to arrive or depart early or late. Because the Deerfoot program is built around the cabin community, late arrivals and early departures are disruptive for everyone involved. Check-in is at 3:00 pm on opening Saturday and departure is no later than 12:00 pm on closing Saturday. Please plan accordingly. How does Deerfoot handle camper medications? Medication ordered by the camper’s medical provider for daily administration must be delivered to camp in unit dose packaging for the camper which is packaged by a pharmacy. All meds that will be brought to camp MUST be written on your child’s health form, signed by the physician. For any last-minute medication changes, a physician’s order is required when camper arrives. This includes prescription, over-the-counter, and inhaled medication. Most local pharmacies, particularly major chains, will package your camper’s meds by unit dose for you on request. If you don’t have a local pharmacy that will package medications by unit dose, we suggest Pillpack (listed below). Please complete your child’s medication information as soon as possible to avoid possible late fees associated with rush delivery. We recommend processing your camp medications 60 days prior to the start of the session. Suggested pharmacy: Pill Pack (www.pillpack.com, 855-745-5725). Mention your affiliation with Deerfoot Lodge if you call either of these suggested pharmacies. What is the camper-to-staff ratio at Deerfoot Lodge? We keep this to 1 counselor for every 5 campers in most situations. In several activities, where individual instruction is required, the ratio would be less. Occasionally, in free-time activities, among other things, the ratio may be slightly less. When our kitchen and maintenance teams are considered, Deerfoot supports its 90 campers with over 30 staff members. Is Deerfoot Lodge Safe? The nature of wilderness activity and the Deerfoot program involve risks. Our program and trips require living in tents or open cabins/lean-tos, washing in the lake (no showers), physical challenges, wild animals (insects, bears, snakes, bats, wild cats, etc. ), uneven terrain, severe weather, falling trees, and traveling in vehicles (15 passenger vans, or other) driven by counselors on both highways and dirt roads. Overnight backpacking and canoe trips into the wilderness may involve swimming at sites not inspected by State Health Departments, remote access to emergency medical facilities (up to 24 hours), and food preparation by counselors and campers. Eligible dietary restrictions are accommodated by staff members who are not food service professionals. Backcountry destinations are far from medical care centers (24+hours) and often include hazardous terrain, including cliffs, caves, steep trails, and waterfalls. Inherent in these activities and conditions are risks to life and safety for both campers and staff. Thus, it is important for staff and campers (and their families) to understand and assume these risks together. We accept them because valuable growth comes from learning how to identify hazards and adapt behavior, not only at Deerfoot, but also for a lifetime of enjoying the outdoors. The recognition and management of risks and hazards in wilderness settings is taught and practiced at Deerfoot. Three weeks of staff training includes certification in Wilderness First Aid, Lifeguard, and CPR, emergency procedures, driver training, as well as skills for leading wilderness activities. Deerfoot has a registered nurse who lives in the camp Health Center. A doctor’s physical exam within two years is required before coming to Deerfoot. The New York State and the North Carolina Health Departments inspect their state’s camp each summer. All waterfront activities are supervised by a certified Lifeguard or Water Safety Instructor. Even Deerfoot’s best efforts cannot guarantee safety or eliminate real risks to life and limb. If after reading through Deerfoot’s publications (website, brochure, registration materials, etc.) 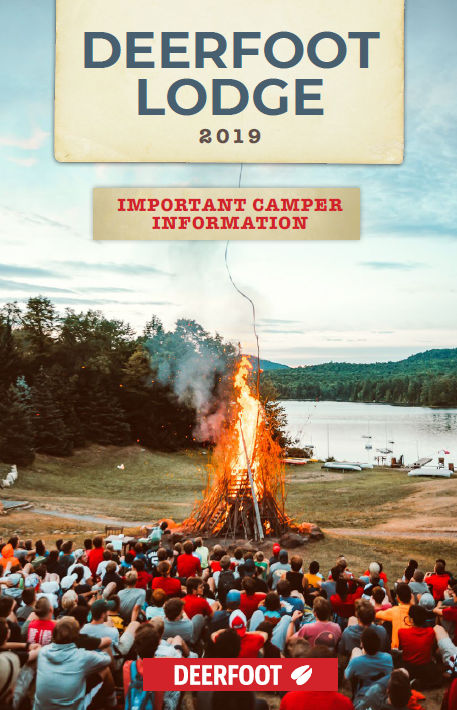 you have any questions about Deerfoot’s environment, programs, activities and/or personnel please don’t hesitate to call one of the Camp Directors to discuss these. They can be reached at (855)His-Camp. It is important that parents and campers assume these risks with us as we together participate in the Deerfoot program.